•Thermal shield insulation, this attractive two bottle cooler comes with a combination corkscrew. •Designed and assembled in the USA. Lifetime warranty. 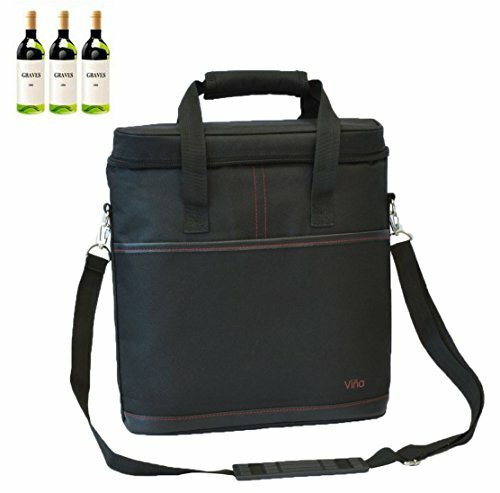 •Adjustable shoulder strap,durable zipper great dual large wine bottle bag for on the Go! •About 13" x 11.5" x 4" (L x W x H), with dividers that allow the bag to carry 3 wine bottles. Portable: With a hand tote strap and a shoulder strap,easy taking.Durable zippers. Occasion: Outdoor picnic, camping party for wine safely storage and share, great wine accessory wedding gift.